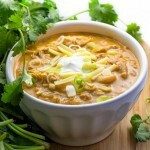 Spicy and delicious white chicken chili! • A note on chili powder: One of my secrets to great chili is to use two or three different chili powders for a great depth of flavor. For this chili I used New Mexican and Chipotle chile powders. Spice and Roast the Chicken: Preheat the oven to 350ºF. Spread chicken out in a roasting pan. Drizzle with 1 tablespoon olive oil and season with 2 teaspoons chili powder, 1 tablespoon cumin, 1/2 teaspoon salt and a pinch or two of cayenne. Roast for 30 minutes. Shred or cut into bite sized pieces. Set aside. Remove the pot from the heat and let it cool for 5 minutes or so before proceeding. With the pot still off the heat, stir 3 cups of cheese into the pot, 1 cup at a time. Then stir in 1 cup of sour cream. (Or for Dean’s richer, creamier version, add all 6 cups of cheese to the pot and 2 cups of sour cream) Bring the pot back to a gentle simmer over low heat (to keep the dairy products from separating, don’t boil). Simmer the chili for 15-20 minutes, adjusting with additional chicken broth, if you like. A method I like to use for great added texture is to use a potato-masher in the pot to mash half the chicken and beans. Then stir to combine with the rest. Serve chili in bowls with garnishes on top or on the side. Nutritional information for this white chicken chili recipe is calculated assuming you’re following the lighter version of the recipe. Nutrition Information shown is an estimate calculated by an online nutrition calculator. It should not be considered a substitute for the advice of a professional nutritionist.